This is a generic scenario that I put together a few years ago for the Retro variant from Minden Games. 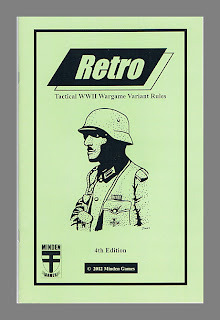 The idea is that it can be played with most tactical WWII systems with relatively little tinkering. It should be able to work with most nationalities. 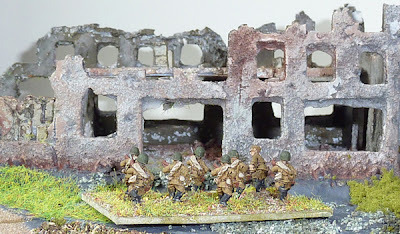 I don't normally ask for comments, but I would like to hear from anyone as to what system they used it with and how it worked out, as I have another scenario lined up that involves 'hitting the beaches' and the feedback would be helpful. adjustments, I have used it with four other tactical systems. Situation: The remnants of an elite company have become surrounded while defending a small village. They have orders to hold and await assistance, but time is short, the enemy are about to launch their third attempt at dislodging the defenders. Environment: It is January, wheatfields do not exist and count as open ground. Select a map that has (at least) 6 separate buildings that are each located (either all or in part) within 5 hexes of a single hex chosen by the defending player AND at least part of one of those buildings is within 3 hexes of a map edge. The defending player chooses which side of the board / map is friendly and identifies 6 buildings within 5 hexes of a single hex as being friendly. The defending player then puts their entire Order of Battle in any, some or all of the 6 selected buildings and / or any hex adjacent to those buildings. The attacker may now set up anywhere on the board or map but may not setup closer than 5 hexes to any defending units or closer than 7 hexes to the map / board edge that is friendly to the defender. Game Length: 9 full turns. Defenders setup first (3 squads may set up concealed if you are using those rules). Attackers move first. 1 x radio for 1 module of 105mm OBA. 12 non-elite squads, 2 x 8-0 leader (or rated 8 NCOs) & 1 x 9-1 leader (or rated 9 Officer) leaders. For Support Weapons place 4 lowest valued MGs and 1 highest valued MG in a container and blindly draw just 4 of those 5 weapons. In addition, the attacker receives a radio for 1 module of 80mm OBA. Note - in this scenario, the term MG means any and all LMG, MMG and HMG types that are provided in the game for that side. Play Balance: Assist defender, reinforcements arrive turn 4 instead of 5 (see special rules). Assist attacker, add 1 non-elite squad to initial setup.